On the surface, Mandy seems to pack in everything great horror is made of. It’s got vengeance, it’s got violence, and it’s got a generous dose of surreal otherworldliness thrown in for good measure. Best of all, it’s got the one and only Nicholas Cage (The Wicker Man, Mom and Dad) at his biggest, boldest, and craziest. But does Mandy actually deliver the punch people say it does? Mandy is the sophomore effort of Italian-Canadian director, Panos Cosmatos of Beyond the Black Rainbow fame. (Cosmatos also co-wrote the script alongside Aaron Stewart-Ahn.) It is also among the last films to feature the haunting score of celebrated late Icelandic composer, Johann Johannsson. Along with headliner Nicholas Cage, Mandy stars Andrea Riseborough (Hidden, Birdman), Linus Roache (The Forgotten, Vikings), and Richard Brake (Hannibal Rising). Mandy takes the viewer all the way back to 1983 and follows the misadventures of Red Miller (Cage) and his beloved artist girlfriend, Mandy (Riseborough). Red and Mandy live the type of quiet existence many people dream of in the beautiful Shadow Mountains. However, their peaceful world is torn apart when the unlucky Mandy unwittingly catches the eye of cult leader Jeremiah Sand (Roache). With the help of a biker gang called the Black Skulls, Sand’s cult attempts to kidnap Mandy and subdue Red after breaking into their idyllic home. When Mandy doesn’t make it out of the ordeal alive, Red embarks on a path of bloody revenge. As any diehard Nick Cage fan can tell you, half the point of seeing one of his films is watching the man do his thing when it comes to intense, uninhibited, next-level emoting. 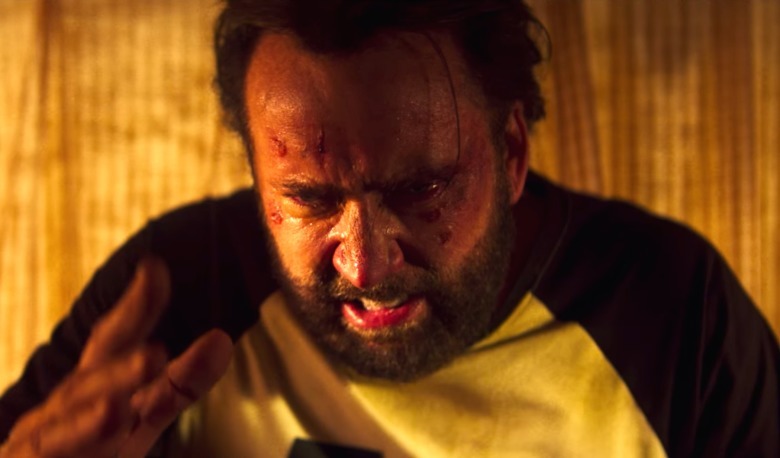 Let us assure you he absolutely does not disappoint in that regard here, as Mandy is packed with incredible Cage moments. You get to watch him run through a full range of different emotions with him fully turning the Cage magic all the way up to ten and beyond at various points. 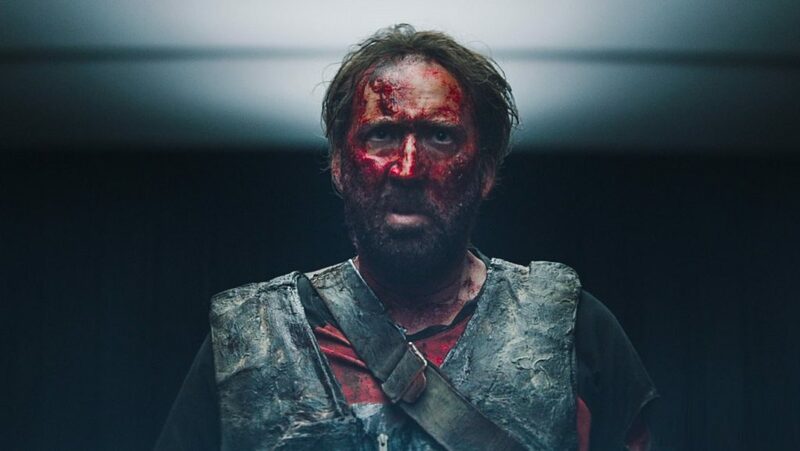 Cage does an amazing job of bringing Red to life as well and successfully portrays him as the hollowed out shell his trauma eventually turns him into. In fact, he does such a good job here it’s difficult to impossible to imagine anyone else playing the part quite as well. Mandy as an entire film also shines on other levels. It does start slow, taking its time when it comes to fleshing out the characters of Red and Mandy, as well as introducing you to their world. 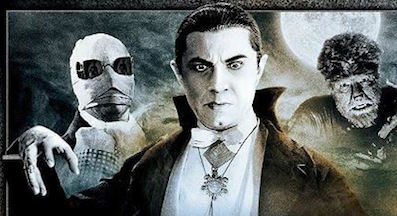 It then takes an abrupt nosedive into dark, surreal, and decided grotesque territory. The imagery and violence alone can’t help but make the viewer’s head spin as they watch, completely horrified but unable to look away. Linus Roache also plays a worthy adversary to Nicholas Cage’s broken Red. Finally, the Johansson score adds the perfect auditory accompaniment to Cosmatos’s uniquely expressive directing style. If you love stylish revenge thrillers that have “future cult classic” written all over them, there’s a good chance you’ll be pleased you gave Mandy your time. It easily could have been just another addition to the genre that’s entertaining, but ultimately forgettable. 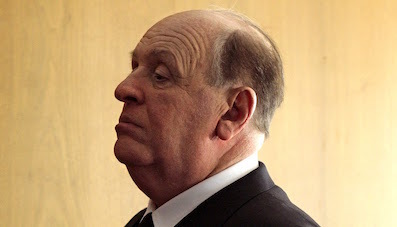 However, Nicholas Cage’s acting combined with Cosmatos’s ability to maintain the ever-important emotional intensity throughout the film easily set it apart from the rest of the pack. Yes, it’s a supremely violent exploitation film, but it’s one with a heart and soul that are well worth exploring. No, it’s definitely not for everyone, but if you enjoy arthouse-style slow burns that eventually lead into mind blowing madness, Mandy promises you a crazy, neck-breaking ride you’re not likely to forget anytime soon.